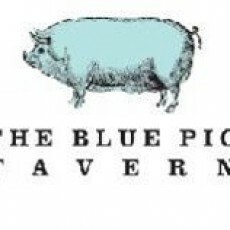 Whether a guest of Congress Hall, a neighboring hotel or a Cape May native, all are welcome for breakfast, lunch or dinner in the distinctive dining rooms of the Blue Pig Tavern. Tucked in the corner of Congress Hall that fronts on Congress Place and Perry Streets, its name derives from a gambling parlor sited in Congress Hall in the mid-1800s. Earlier still, in the 1700s, Elias Hughes operated a tavern for whalers on this site. It was the first tavern in Cape May. Beloved by locals and visitors alike, there is no better place to enjoy classic American comfort food. In the warmer months, dine on our wonderful, secluded patio. In the cooler months, cozy up to our magnificent dining room fireplace. Executive Chef Jeremy Einhorn has implemented a delicious farm-to-table menu featuring fresh produce, herbs and eggs from our very own Beach Plum Farm, located less than 2 miles from the restaurant!